The end is in sight. I got some more work done on the Mill upgrade over the weekend and am now at a point where I am happy to start making chips. Last time I tried to get some work done on the mill I was defeated trying to get a fan set up. 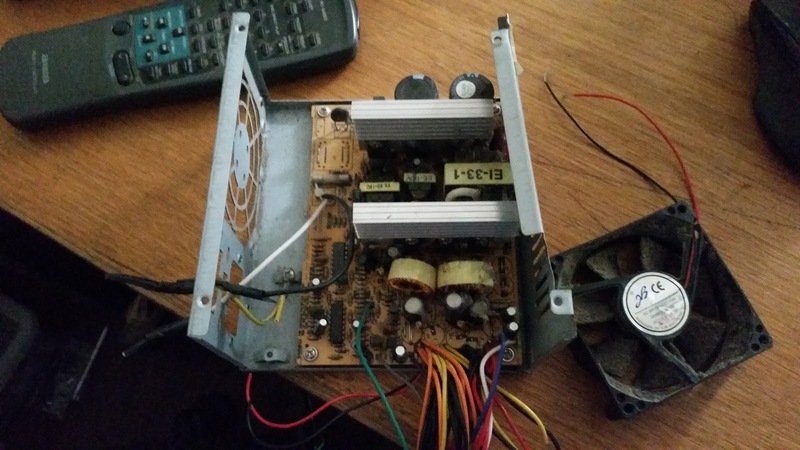 This time I found a fan in my junk pile that works. 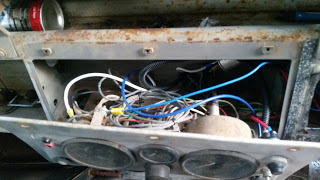 This is the old power supply that I installed in the control box here. Then I replaced it here. Although it has been sitting for over a year the fan still works from it. It is labelled as a brushless fan but I figured that the designers wouldn't have gone to the trouble to drive the fan with some kind of waveform and it could be driven with plain DC. It turns out my guess was correct. So I now have a fan to go in the case. It was even exactly the right size for the mounting holes. Here it is set up in the black box testing phase. 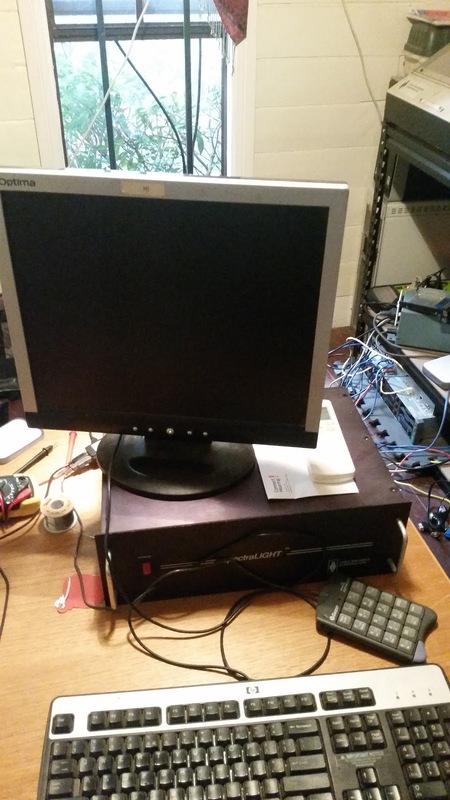 I had it rigged up on the desk without plugging in the machine just to get this stuff sorted. Now that I have the fan and everything sorted it is time to move it off the desk onto it's home on the CNC bench. Here you can even see the penguin power. 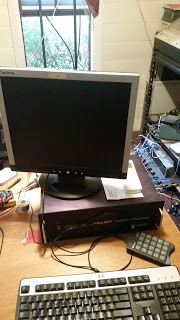 I am planning on using just the mouse and the little numpad pendant as the interface for this as there won't be much call to type stuff in and this will keep the fairly crowded bench clearer. For now however while I am setting up the parameters for the stepper motors as a proper keyboard makes this much easier. Now I just need to work out the toolchain to turn a CAD drawing into code to run on this machine. 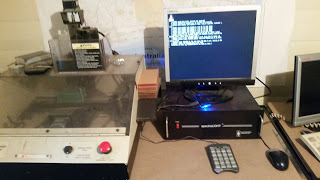 Getting it onto the machine should be fairly easy as it runs a quite up to date version of Linux so I can just set up an NFS share or similar for loading up programs. Yesterday I got some more work done on the Land Rover. I wanted to do something a little cleaner than stripping the axle further so I decided to get some work done on the wiring. Originally the only fuses in these cars are the 2 you can see in the left of this picture. I had added the terminal block in the middle to make life easier for connecting stuff up. But it still wasn't fused. 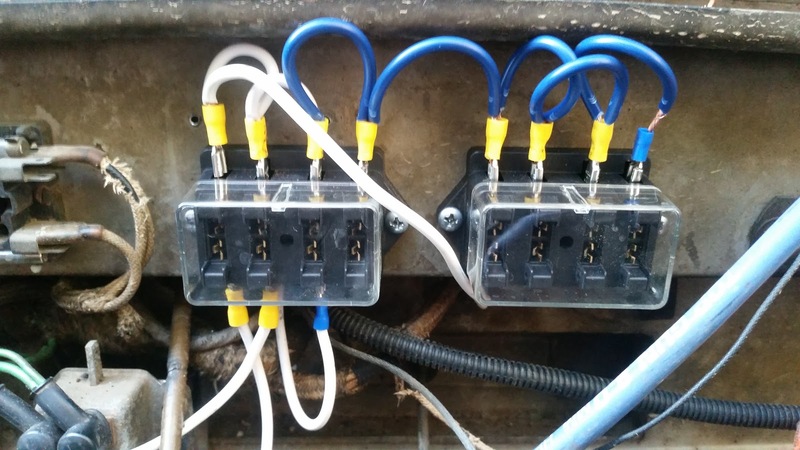 So I removed the terminal block and added these fuse boxes I got from AliExpress. They were quite cheap and you can see and feel it in the build. But they are solid enough that I have no doubts they will suffice. 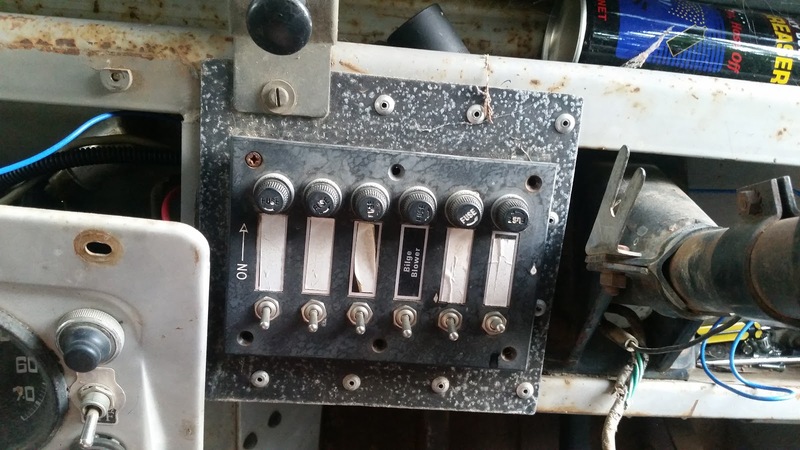 When I ordered them I thought that not having a bus bar connecting all of the fuses would be an advantage. However as I started to wire in the stuff I already have that needs to be fused I realised that really it does all need to be connected to positive supply. So I just daisy chained together the top pins so they are all live and the devices will connect on the bottom. 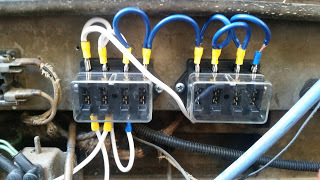 This is one of the reasons I want to add my own fuse panel. This has been added by a previous owner and seems to have been set up for running spotlights and such from. 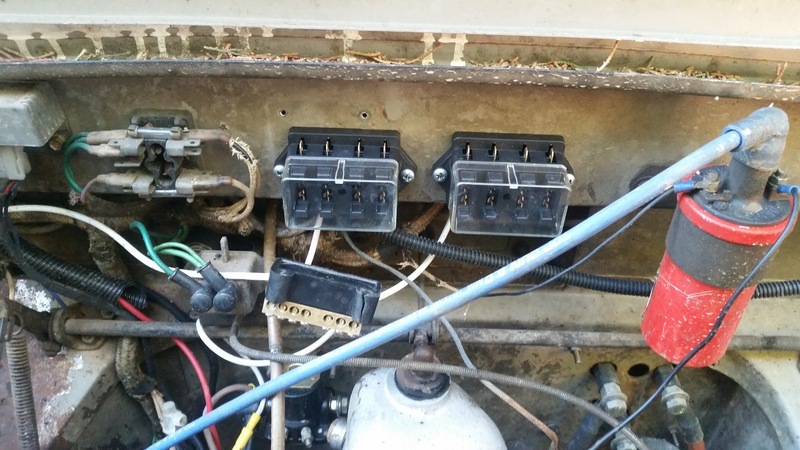 However I do not need the switches there and the fuses can be moved elsewhere. This will clear up a heap of space so I can build a gauge cluster there. Anyone who has been around me for a little while knows I like to be able to see what the car is doing. Particularly considering that work I am putting into this I want to be able to monitor it's behavior so that if something starts to go wrong I can start taking it easy or something to help it along. 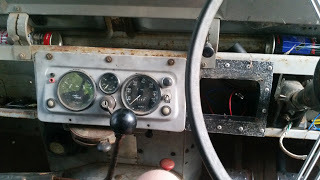 At this stage I am looking to add a voltmeter, tacho, oil pressure & probably manifold vacuum gauges. 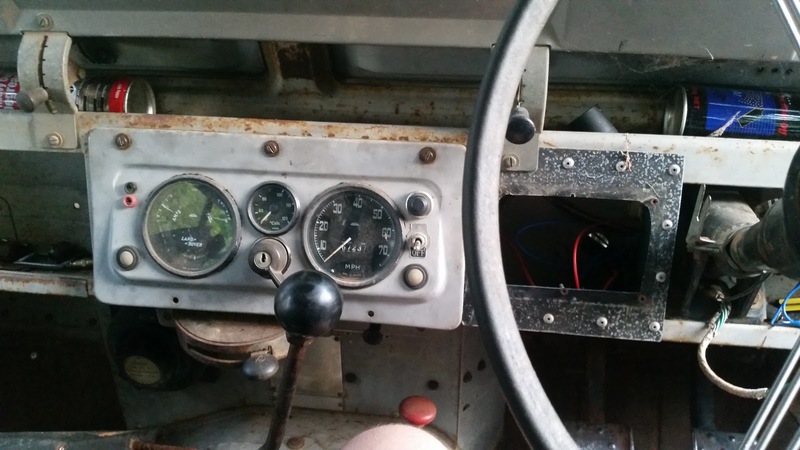 I may also add an oil temp gauge, but that can happen later; Particularly if I start working this a bit harder. It does look pretty bad in here. But if you pull it out all the way with the speedo cable removed then it is all quite clear. Though with the fuses wired up now hopefully I will be able to leave this as it is for quite some time. This is where I got up to. I still need to drill out the rivets that hold the plate on for the old fuse panel. But it was starting to get late and the mosquitoes had come out so it was time to call it a night. 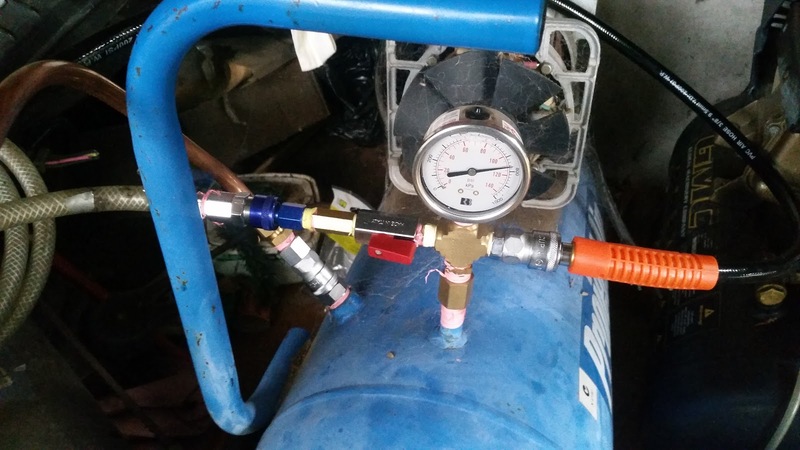 A short while ago I got a new air compressor to go with my existing system. It's not really what I am looking for because it is still a fairly basic direct drive compressor. But the price was right and it will still improve my current setup. This is what I have set up now. I do need to do some tidying up and cut down some of the flexible hoses to only the minimal length needed. The 2 compressors on the right of the photo are the ones I have hooked up. The one on the left does not work and needs some wiring done to fix that. So it is only acting as an extra reciever. Now with the addition of the second working compressor I have 80L of storage. Not quite ideal yet. 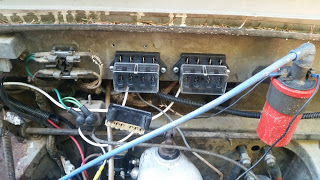 The outlet from the original compressor is connected with the rigid copper line in the background. The new one is connected through the ball valve to the manifold at the top of the tank. Coming out the other side is the outlet from the reciever. I may change this arrangement so that there is less leverage on the top of the reciever. 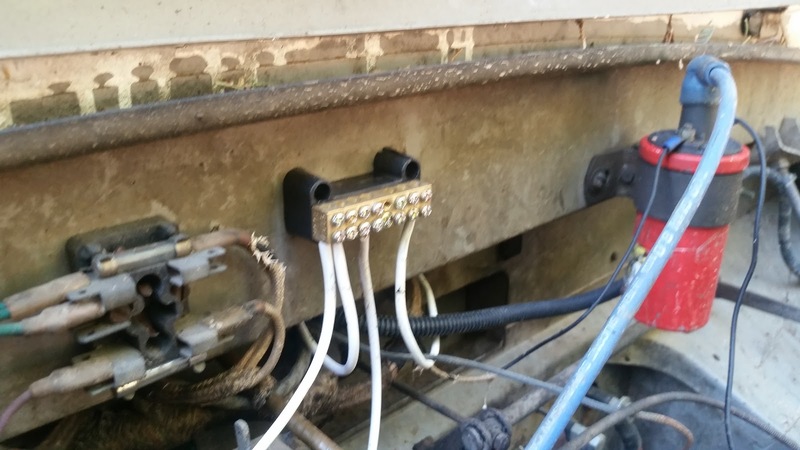 I will probably put the manifold on the wall or something so it isn't rigidly connected to the receiver. This is a big improvement here. 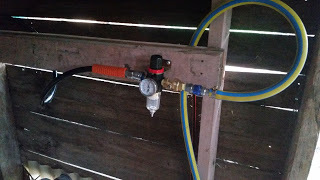 The regulator is undersized unfortunately but not too badly that it is unusable. 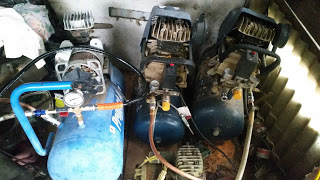 The black hose on the left comes from the manifold on the top of the receiver. 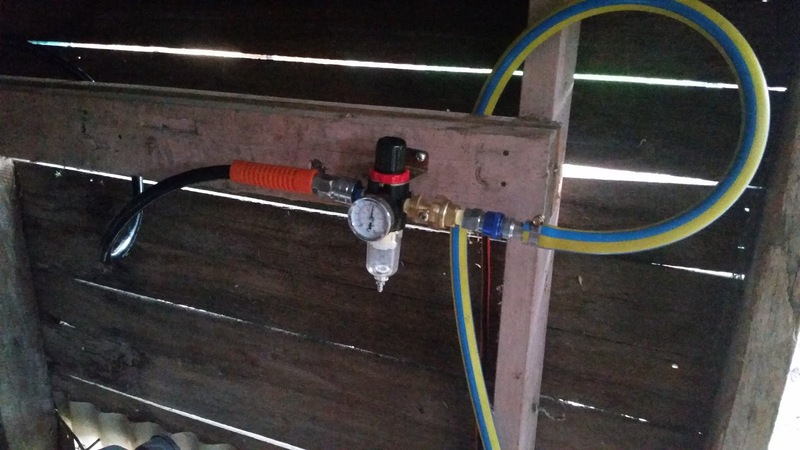 The coloured hose on the right goes up along the ground to the verandah where I do most of my work. It isn't buried though so I can quite easily move it to where I am working. You can just see the oiler to the right of the regulator. I am trying this mounted here because I've not really been happy with it hanging out the bottom of the tool I am using. I am using Nitto quick disconnect fittings to connect everything together. Unfortunately they do introduce some restriction to flow. But with the amount of air I am using is not really that much. Once I get this space cleaned up a bit and I'm happy with it I will probably plumb it together with plain tapered fittings so as to minimize restrictions. I've got some more work I've been doing on the CNC that I need to finish before I can put up here. 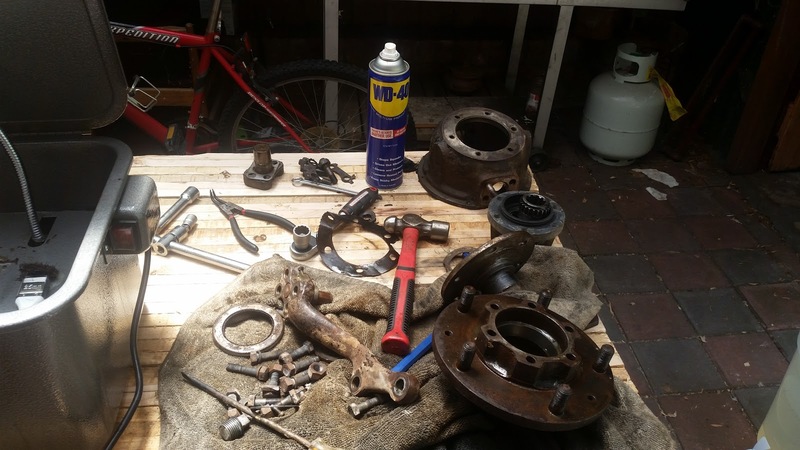 I've been making some progress on disassembling the hubs for the Land Rover. I even now have one of them completely apart and even the oil and muck cleaned off it. There are nearly all of the parts. 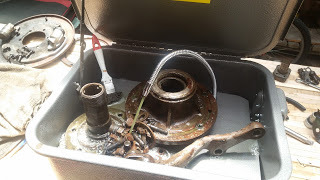 The Free Wheeling Hub is underneath the rag in the foreground and the bearings are sitting on the other side of the parts washer. I want to soak them in petrol or some other fairly strong solvent that will not have much water in it. To make life easier for myself I decided to get a new toy. 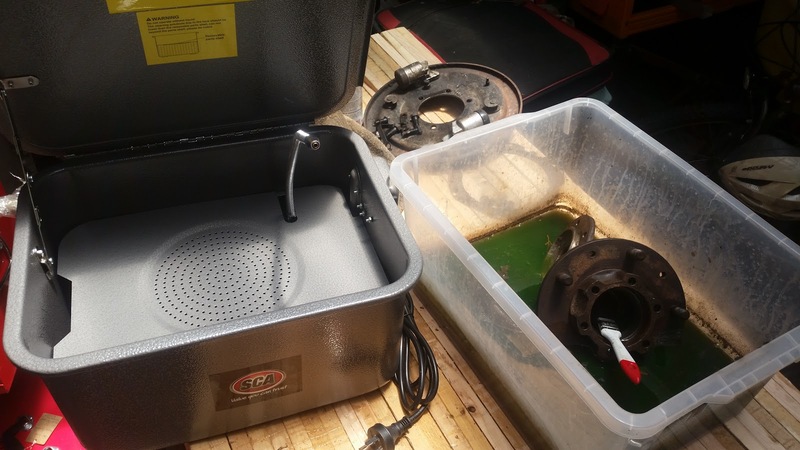 On the right is what I have been using and on the right is a new parts washer from Supercheap Auto. I was looking at the prices for a replacement circulation pump when I saw Supercheap have a sale on these parts washers which meant that they were only a few dollars more than the pumps I was looking at. 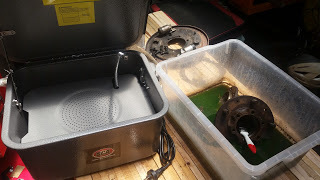 So for the extra few dollars what I got was essentially the bucket (the one I have been using is still serviceable), the spout and the electrics. All of this is stuff I could have gotten, but not for that price and not that quickly. Also the bucket has a shelf in it so I don't have to have all of my parts floating in the degreaser. Also it is made from metal rather than plastic which means it will handle more knocks than the plastic one will. I discovered a heap of bolts that I'd left in the plastic bucket. I would've found them, but probably not before they got all mixed up. Now I need to get a clean plastic crate and put all of these parts in it with a splash of kerosene or something to form an oily film so that the parts can't rust. Then I can start pulling down the other one. In the meantime however, it's getting warmer and I've remembered that I have A/C so I'm going to do some inside projects instead now.